Haven't been blogging much, so I thought I'd share this card and a little of what's going on in life. I love this typographic Reverse Confetti set, Big Notes. This is a one layer card that took about 10 minutes. 1. Stamped in Versamark and embossed in white (preheating the heat gun for a good 20 seconds really does help eliminate warping). 2. 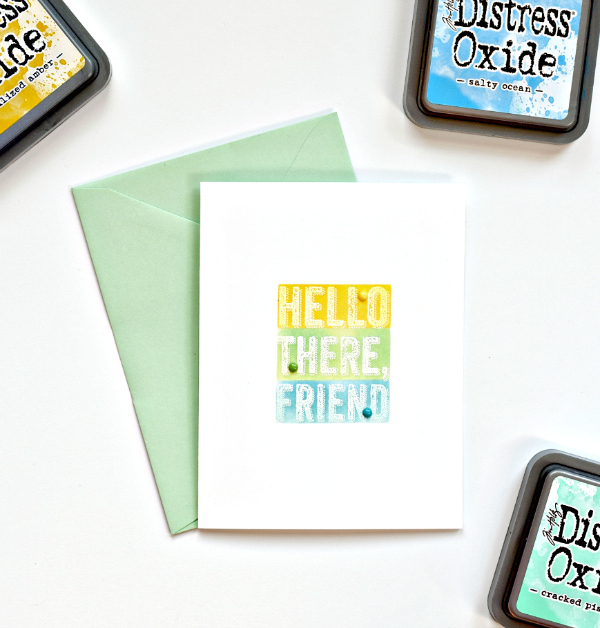 Masked off the lines of the sentiment (using 3M Post-it Adhesive tape) and blended Distress Oxide inks (as shown in pic) over each line. 3. Turns out that the embellishments included in an Altenew card kit matched the ink colors perfectly, so I added a few enamel dots. The past few weeks have been a bit of an adventure. After Mike retired we spent a week in Florida, soaking up some lovely warm sunny weather and eating out all week. When we returned, I noticed my heart rate started slowly going down. Over a period of 3 weeks, it dropped 20 points. Google convinced me I needed a pacemaker. Then I started getting really short of breath going up the stairs, my ankle got a little swollen, and I gained 6 pounds. My clothes were so tight. I chalked up the weight gain to vacation. Finally, Mike suggested I notify my doc and I was surprised to learn that I had retained so much fluid it was affecting my heart and lungs. Could I be a bigger dope? My mom went through congestive heart failure episodes dozens of times, and if you read my blog back then, you know that I was there in the ER with her every time. I just didn't put the pieces together for myself. Taking a diuretic for a few days did the trick and I felt so much better. My heart rate went back to normal, I lost the 6 pounds and I could walk up the stairs with no issues. Yeah! But, I was upset. There's a blood test (BNP) for heart failure and I knew that my numbers got progressively worse over the past year. So I had a meltdown over the weekend, convinced I was really sick and thinking about how soon Mike was going to need to find a new wife. Because, you know, google makes me crazy. I had another BNP test yesterday and was thrilled to learn that my numbers had improved dramatically! Turns out that the surgery improved the heart failure, but the trip to Florida and the 7 days of eating out just added too much sodium to my diet (restaurant food is crazy high in salt). So the drama is over (hopefully for a long time) and I'm swearing off google. Search engines kill more people than car accidents and falling pianos combined! :D Love this and you and happy about your news! Great news, so sorry that you had so much stress beforehand. Great news! Love the card. so pleased to hear u r ok - and such a fun cheery card - seems i can never just to a 10 minute card and make it come out looking good! Glad you are feeling better and know what to do next time, because you will be holidaying and eating out, it's good for you! Did Mike know you were shopping for a new wife for him??? NO! I always wait until the drama is over to confess my craziness! I wish my husband - the pancreatic cancer survivor - could learn the search engine lesson! Poor guy, every symptom panics him. Glad you are feeling better! Joan, your card is fabulous, first off. Second: I wonder what would come up if we Googled "why we Shouldn't use Google" DON't do it... just say NO, and keep saying no except for fun stuff like: funny puns about bunnies! So glad to see you back. Google can be both a blessing and curse--choose wisely. Take care. Happy to hear that you are doing so much better. Our bodies are amazing in that they let us know when things are not quite right. Am confident that you will listen to it and respond accordingly. After all, you are worth it! Heaven help us Joan. Google is wonderful for facts, info, ......... just as long as it doesn't apply to us and our state of health, no matter what the case may be. I'm a cardio person, with issues less frightening than yours, and have now been diagnosed with triple negative breast cancer, at the grand old age of 77. What did I do on receiving the diagnosis? Went straight to Google and HE/IT frightened the pants off me. About to start chem o etc, but without the benefit of "his"(Google) advice!! Keep talking to your Doc, Mike and your inner common sense, ........ Above all, maintain your sense of humour, if for no other reason, than you inspire me, a whimp! We'll get where we want to be without G's interference, thank you very much! Many hugs and happy optimistic thoughts coming your way . oh my goodness, what a terrible state! I know someone in the crafty world who was treated for the same thing and is doing very very well. Please let me know if you want me to put you in touch with her. Hugs back at you! So glad u r ok, Joan! Google has really scared me several times & now I just wait to ask the Dr. My husband was diagnosed with pancreatic cancer last May & it was so scary to read all the things that supposedly would happen. He has a great Dr. & has tolerated the chemo so well they are amazed. A positive attitude really helps & I can tell you have one so stay off the internet except for all these awesome blogs! You are in my prayers!